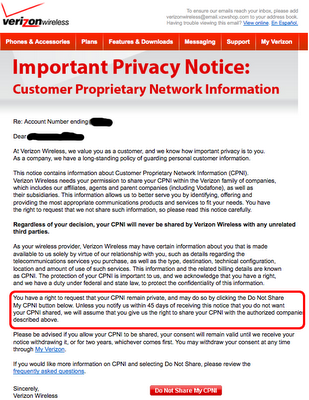 I got this lovely IED of Privacy Fail in my inbox this morning. See the circled text. It looks like we get opted-in by default! If you don't want to be sold and traded at Verizon's every whim, you should probably try to hunt this down or access the setting in your VZW account.